There are many different understandings out there. Living in the Divine Will is living in another sphere, though on earth, in the sense that all is present, now, and the infinite number of Divine Lives given to God are for His Glory, and Satisfy, through the Divine Truths, through Repairing and Redoing, for the so many misunderstandings and even losses. All must be done with, in, through and for Jesus, Mary and Their Little Newborn Luisa. This must be our prayer, if we wish to be Luisa’s children and receive the Gift of Living IN the Holy Divine Will. This must be our continuous intention, in our nothingness, One with our little mama Luisa, as her newborn, if we wish to enter the Sphere of Eternity and Fulfill the Will of God according to the Divine Plan. With this Great Gift, bilocate, be with Luisa, in her bed, fused in her womb. Let Jesus and Mary take you wherever Luisa goes, led by her, guided by the Book of Heaven, obedient to Holy Mother Church, directed by the teachings of the spiritual director, then enter with full confidence Luisa’s Acts. Together with her, enter the Sphere of Eternity; traverse the Heavens, the earth, the first moments of Creation, the moments of the good people of the Old Testament, the Acts and the Lives of Jesus and Mary; be present one with Luisa. Open the spiritual eyes, love with Divine Love, adore with Divine Adorations, only possible with Luisa. Be One with Jesus and Mary, by means of the Gift of the Divine Will given to the Redemptrix of the Divine Will and Mother of the children of the Fiat, the One who Ascends and Descends and never leaves her little children behind (V21-3.19.27); go to the aid of All souls giving what Jesus and Mary gave her, that is, Jesus’ Insignia, His Blood, His Wounds, His Merits, His Divine Will to All. Without fusing with Luisa, becoming one with Her, these prayers, entering into the Eternal Sphere, putting into practice the Truths in the Book of Heaven, doing Divine Acts, is presumptuousness and not an actuality. We must understand the Order of Grace, essential to the fulfillment the Divine Plan. We must disappear, confess our nothingness, and know that, One with Jesus, Mary and Luisa, God is All, in All and For All. If we can attribute nothing to ourselves, why can we not forget ourselves? If we are to recognize Our Lord in others, how is it we cannot first and foremost do this within ourselves? If we are inspired of anything, our response must be, with the Sign of the Cross, “Fiat! Only with mama Luisa!” Then we shall see what the Lord makes of the situation. If we are truly nothing, one with Luisa, we can do nothing apart, nothing on our own, for only rebellion goes off on its own. A true child loves and unites continuously! Below are additional readings from the Book of Heaven reflecting on the “Sphere of Eternity”, that Sphere we are entering into, one with Luisa, by fusing and calling the Divine Will in all acts. She who when obedience commands, gives her FIAT. and know what it means to Live In the Divine Will. that Luisa’s children Live In the Likeness to their Creator. According to IL Veggente (The Seer), it is said “Enter the Holy Sheepfold”, which declares that Mary is the Portal of Christ, the way into the Sheepfold, as Mother and guide of the Catholic Church. Christ is the Doorway and the Good Shepherd. Christ is in time for Mary. Mary is eternity for Christ the Eternal Word, the way, the truth and the life. We can now say LUISA is the PORTAL of Jesus and Mary, the PORTAL of the Divine Will, the PORTAL of the Sphere of Eternity. We must be ONE with her to participate in the Divine Life. Without being ONE with Luisa, without forgetting ourselves and relying on her for everything, continuously, we remain in the miserable, sinful, human, and possibly diabolical, spheres. V12 – 4.8.18 – “I found myself in Jesus. My tiny atom was swimming in the Eternal Volition. And since this Eternal Volition is One Single Act that Contains, Altogether, All the Acts, past, present and future – since I was in the Eternal Volition, I took part in that Single Act which contains All Acts, as much as it is possible for creature. I took part also in the Acts which do not exist, and which must yet exist, until the end of the centuries, and until God shall be God. And for these Acts too I loved Him, I thanked Him, I blessed Him, etc. There was no Act which escaped me. I took the Love of the Father, of the Son and of the Holy Spirit, and I made It mine, just as Their Will was mine; and I gave it to Them as if It were my own. How happy I was to be able to give Them Their Own Love as though my own! And how They found their Full Contentment and Complete Outpouring in receiving their Own Love from me, as if It were mine! But who can say everything? I lack the words. Now, Blessed Jesus told me: “Have you seen what Living In My Will is? It is to disappear and to Enter the Sphere of Eternity; it is to Penetrate Into the Omnipotence of the Eternal One – Into the Uncreated Mind, and take part in Everything and in Each Divine Act, as much as it is possible for a creature. It is to make use, even while on earth, of All the Divine Qualities; it is to hate evil in a Divine Way. It is extending oneself to Everyone without exhaustion, because the Will which Animates this creature is Divine. It is the Sanctity which is Not Yet Known, which I shall Make Known, and which shall Place the Last Ornament, the Most Beautiful and the Brightest among All other sanctities. It shall be the Crown and the Fulfillment of All the other sanctities. V13 – 1.20.22 – “So I AM; and if that lord goes around one city, I go around the whole world, and maybe All generations; and wherever I find the littlest, the poorest one, I take her and place her in the Eternal Sphere of My Volition, saying to her: ‘Work Together with Me In My Will. What is Mine is yours. If you have something from your own – lay it down, because in the Sanctity and in the Immense Riches of My Will, it is nothing but miserable rags’. Wanting to have one’s own merits is of servants, of slaves – not of children. What Belongs to the Father, belongs to his children. Besides, what are all the merits that you could acquire compared to One Single Act of My Will? All merits have their own little value, weight and measure; but who could ever measure One Single Act of My Will? No one – no one. And then, what are your merits compared to Mine? In My Will you shall find them All, and I make of you the owner. Aren’t you happy? V17 – 9.11.24 – “My daughter, remember that I asked of you a “Yes” in My Will, and you pronounced it with all love. That “Yes” still Exists and holds its Prime Place In My Unending Will. Everything you do, think and say, is Bound to that “Yes”, which nothing can escape, and My Will Enjoys and makes Feast in seeing a human will of creature Live In My Will; and I keep Filling her with New Graces, making of all of your acts Divine Acts. This is the Greatest Portent which Exists between Heaven and earth. It is the Object Most Dear to Me; and if that “Yes” were to be snatched from Me – may this Never Be! – I would feel like being Torn from Myself and I would Cry Bitterly. And Jesus, again: “My daughter, calm down. As soon as you placed yourself Again In My Will, All things Regained Calm and took the Attitude of a New Feast. May your “Yes” Continue its Rapid Rounds within the Immensity of My Will. Ah, daughter, neither you nor those who direct you have known what it means to Live In My Will; this is why you do not appreciate it, and keep it as a thing of no importance – and this is a Pain for Me. On the contrary, this is the Thing which Interests Me the Most, and which should, more than anything else, Interest All! But, alas, they pay attention to other things – things which are less pleasing or Indifferent to Me, rather than to that which Glorifies Me the Most, and which gives them, also on this earth, Immense and Eternal Goods, Rendering them Owners of the Goods which My Will Possesses. See, My Will is One, and Embraces All Eternity. Now, by Living In My Will and by making It her own, the soul comes to Take Part in All the Joys and Goods that My Will Contains, and she Becomes the Owner of them. And even though while being on earth she does not feel all those Joys and Goods, by keeping them in Deposit Within her human will by Virtue of My Will done on earth, when she dies and finds herself Up There in Heaven, she shall feel All those Joys and Goods which My Will Delivered in Heaven while she was living on earth. Nothing will be taken away from her; on the contrary, it shall be Multiplied. In fact, if the Saints Enjoy My Will In Heaven because they Live In It, it is always Enjoying that they Live In Glory; while the soul who Lives In My Will on earth, Lives Suffering, and it is not appropriate for her to have that Joy and those Goods which are Reserved for her In Heaven, with Greater Abundance, because of the Works she has done and her Living In My Divine Will. So, how many Immense Riches does One who Live In My Will on earth not take In Heaven? I can say that All Eternity Wanders Around her to Enrich her and to make her Happy. She is deprived of nothing of All that the Divine Will Contains; she is Its Daughter – Its Very Will, and It Loves her So Much that All Its Joys are Placed in Common with her. V17 – 1.4.25 – Having completed my whole day, I was thinking to myself: ‘What else is left for me to do?’ And in my interior, I heard: “You have to do the most important thing – your Last Act of Fusing yourself in the Divine Will.” So, according to my usual way, I started to Fuse all my poor being in the Supreme Will; and as I was doing so, it seemed to me that the Heavens were Opening, and I went to meet the Whole Celestial Court, and all of Heaven Came Toward me. And my sweet Jesus told me: “My daughter, Fusing yourself In My Will is the Most Solemn Act, the Greatest One, the Most Important of all your life. To Fuse yourself In My Will is to Enter the Sphere of Eternity, Embrace It, Kiss It, and Receive the Deposit of the Goods which the Eternal Will Contains. Even more, as the soul Fuses herself in the Supreme Volition, All go to meet her, in Order to Communicate to her All the Goods and the Glory they have. The Angels, the Saints, the Very Divinity – they All Communicate, Knowing that they Communicate in that Same Will in Which Everything is Safe. Even more, in Receiving these Goods, the soul Multiplies them through her Acts in the Divine Will, and gives back Double Glory and Honor to the Whole of Heaven. Therefore, by Fusing yourself in My Will, you put Heaven and earth in Motion. It is a New Feast for the Whole Heaven. V24 – 4.6.28 – “Now, this is Symbol of the soul who wants to Live In the Unity of Our Will. She Rises Into the Sphere of the Sun of the Eternal Fiat, that Contains So Much Light that no one can escape it, and Possesses All the Seeds of the Lives of creatures. Its Light goes about Investing and Molding Everyone, and Prays that each one may receive the Life, the Beauty, the Sanctity wanted by their Creator. And the soul, from that Sphere, Becomes of All and Gives herself to All; and she Repeats Our Act, which is One, but that One Act has the Virtue of Doing Everything and of Giving itself to All, as if each one had it at one’s disposal and it were one’s own. V20 – 12.12.26 – I was doing my usual acts in the Supreme Fiat, and my Adored Jesus came out from within my interior and told me: “My daughter, in My Passion there is a lament of Mine that came out with Immense Sorrow from the depth of My Tormented Heart: ‘They divided My garments and drew lots for My tunic.’ How painful it was for Me to see My garments being divided among My very executioners, and My tunic being gambled away. It was the only object I possessed, given to Me, with So Much Love, by My Sorrowful Mama; and now, they not only stripped Me of it, but they made of it a game. “But do you know who pierced Me the most? In those garments, Adam became present to Me, clothed with the garment of innocence and covered with the indivisible tunic of My Supreme Will. In creating him, the Uncreated Wisdom Acted as more than a most loving mother; more than with a tunic, It Clothed him with the Unending Light of My Will—a Garment that is not subject to being either disarranged, or divided, or consumed; a Garment that was to serve man in Order to Preserve the Image of his Creator and the Gifts received from Him, and that was to render him Admirable and Holy in all his things. Not only this, but It covered him with the Overgarment of Innocence. And Adam, in Eden, with his passions divided the Garments of Innocence, and he gambled away the Tunic of My Will—a Garment that is Incomparable and of Radiant Light. After this, my sweet Jesus showed me Himself placing my little soul inside a Sun, and with His Holy Hands He held me still within that Light, which was Such that, as it Covered me completely, inside and out, I could not see, nor was I able to see anything but Light. And my Adored Good added: “My daughter, in creating man, the Divinity Placed him inside the Sun of the Divine Will, and all creatures In him. This Sun served as Garment not only for his soul, but Its Rays were Such as to Cover also his body, in such a way as to Serve as More than a Garment for him, Rendering him so Adorned and Beautiful that neither kings nor emperors have ever appeared so Adorned as Adam Appeared, with this Garment of Most Refulgent Light. “Those who say that, before sinning, Adam went naked are wrong. False, false. If all things created by Us are all adorned and clothed, he who was Our Jewel, the Purpose for which all things were Created—was he not to have the Most Beautiful Garment and the Most Beautiful Ornament of All? So, to him Befitted the Beautiful Garment of the Light of the Sun of Our Will; and since he Possessed this Garment of Light, he had no need of material garments in order to cover himself. As he withdrew from the Divine Fiat, so did Light withdraw from his soul and from his body; he lost his Beautiful Garment, and in seeing himself no longer Surrounded with Light, he felt naked. Feeling ashamed in seeing that he was the only one to be naked in the midst of all created things, he felt the need to cover himself, and he made use of superfluous things, created things, to cover his nakedness. “This is so true, that after My Highest Sorrow of seeing My Garments divided and My Tunic gambled away, as My Humanity Rose Again I took no other garments, but I Clothed Myself with the Most Refulgent Garment of the Sun of My Supreme Will. That was the Same Garment as the One that Adam Possessed when he was Created, because in Order to Open Heaven, My Humanity was to Wear the Garment of the Light of the Sun of My Supreme Will—a Royal Garment; and as it gave Me the Insignia of King and Dominion into My Hands, I Opened Heaven to all the redeemed ones; and Presenting Myself before My Celestial Father, I Offered Him the Garments of His Will, Whole and Beautiful, with which My Humanity was Covered, so as to make Him Recognize all the redeemed ones as Our children. And Jesus continued, saying: “My daughter, Both My Mama and I came to set Fraternal Bonds with creatures; We came to Raise decayed humanity, and therefore to take up the miseries and humiliations into which it had fallen, in Order to Expiate for them at the cost of Our Lives. Had they seen Us Clothed with Light, who would have dared to approach Us and to deal with Us? And in the course of My Passion, who would have dared to touch Me? The Light of the Sun of My Will would have Blinded them and crushed them to the ground. “Therefore, I had to make a Greater Miracle, Hiding this Light within the Veil of My Humanity, and Appearing as one of them, because It Represented, not Adam Innocent, but Adam fallen, and so I was to Subject Myself to all of his evils, taking them upon Myself as if they were My Own, in Order to Expiate for them before Divine Justice. But when I Rose Again from death, Representing Adam Innocent, the New Adam, I Ceased the Miracle of Keeping the Garments of the Refulgent Sun of My Will Hidden within the Veil of My Humanity, and I Remained Clothed with Most Pure Light; and with this Royal and Dazzling Garment I made My Entrance into My Fatherland, Leaving the Doors Open that had remained closed up to that Point, so as to let all of those who had followed Me Enter. Forty days after Jesus died, He Ascended into Heaven. Forty days after Luisa died, Our Lady descended from Heaven to Tre Fontane, Rome, Italy. His (Bruno Cornacchiola’s) extraordinary experience at Tre Fontane, on April 12, 1947 led to a lightning conversion to Catholicism. Now, APRIL 12, 2017 is the last day of Lent, eve of the Holy Thursday, Good Friday, Holy Saturday and Easter Sunday, the Resurrection of Our Lord Jesus Christ. 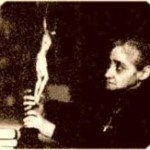 May we pray, one with Luisa, in the Holy Divine Will for a “lightning conversion” for all mankind, and ESPECIALLY FOR THOSE WHO MUST LIVE IN THE DIVINE WILL. We ask that the Holy Spirit fulfill His desire on Divine Mercy Sunday April 23, the original day Luisa was born, giving to the Heavenly Father all the Glory He deserves from all mankind as if All mankind lived IN the Most Holy Divine Will, Restoring All to God, Full Circle, as He Originally Planned.